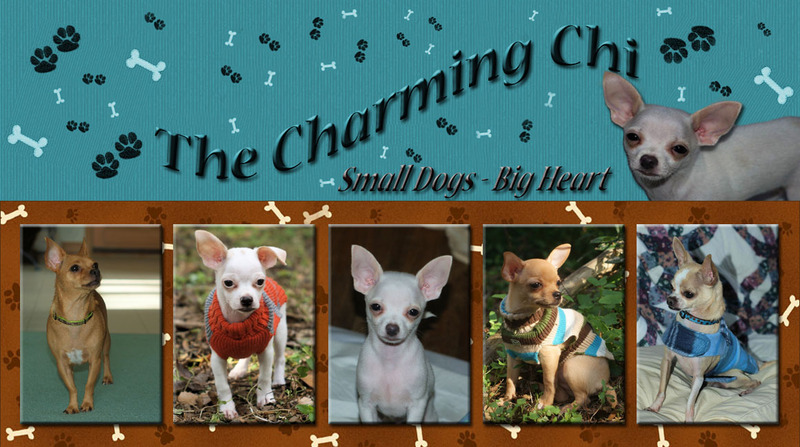 The Charming chi: Fun Gift Ideas for Chi Lovers! 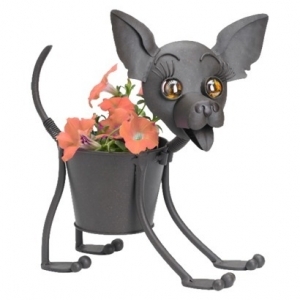 The Chihuahua toothpick holder is a whimsical yet functional bit of kitchen décor. Toothpick holders are a hot collectible right now. 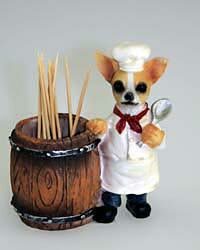 The Chihuahua toothpick holder would be an outstanding addition to your collection, or a great place to start. Chef Chihuahua is decked out in his best uniform, ready to stir the pot with his spoon. Now, doesn't that just make you want to pick your teeth?? I soooo want one of these! I means what could be more 'Chi' than this thing! 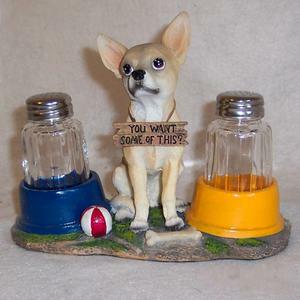 This little Chihuahua figurine has a sign hanging around his neck that reads “YOU WANT SOME OF THIS?” He is sitting between 2 dishes (1 blue, the other a yellowish orange) that hold the salt and pepper shakers. This one is really cute but I think he would look happier if they would put some water and kibbies in those bowls! Looking for a unique way to personalize your Christmas Decorations this year. 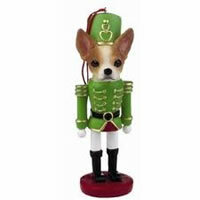 Check out these wonderful Tan & White Chihuahua Nut Cracker Ornaments. The details are amazing. These ornaments are sure attention getters! The details on the faces of the dogs is phenomenal and the quality of the entire piece makes it stand out as a wonderful addition to any Christmas celebration. Do not miss out on this great product! This is just an awesome take on a traditional Christmas item! Such a cute little thing to slip into the Christmas displays! Feliz Navidad! 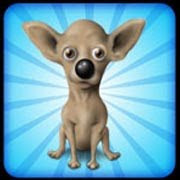 Give a gift from south of the border to the dog lover in your life. 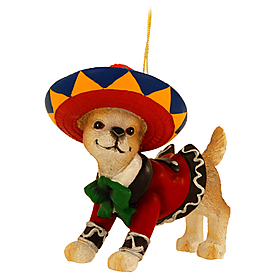 This adorable 3¼" tall, resin Chihuahua is dressed in a sombrero and jacket and is ready to spice up Christmas! His adorable face and glitter accents will make this a favorite ornament for years to come. Well, what can I say! The Sombrero is just perfect for the little Chi! I 'cartoonized' Susu and here he is on all kinds of stuff! 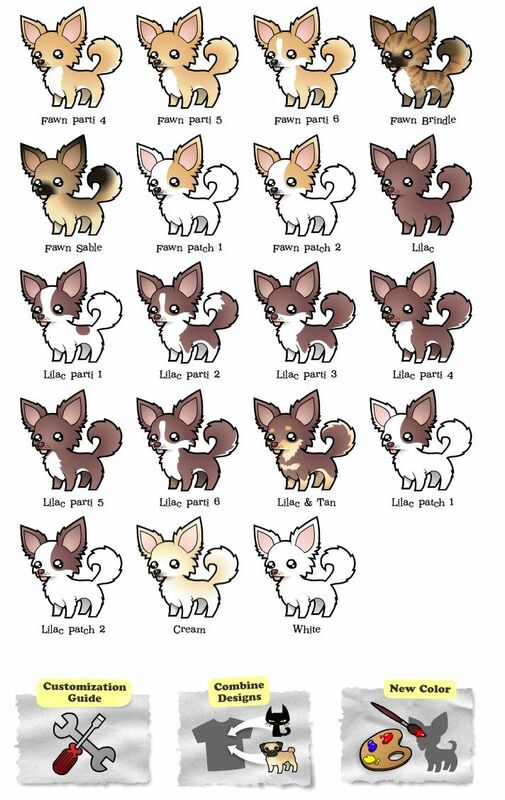 LOL You can even add multiple dogs to items and they have tons of different breeds and even cats! So go have some fun! !